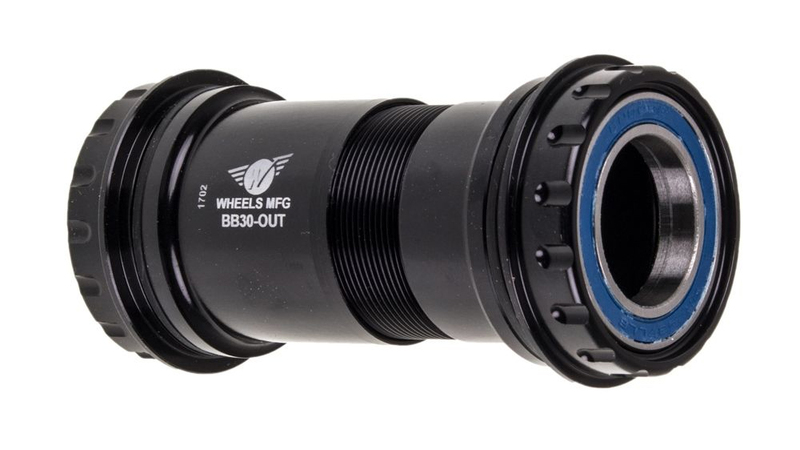 Use this adapter to convert your BB30 frame to a Shimano bottom bracket using high quality Enduro bearings. This adaptor will allow you to run your Shimano Hollowtech II 24mm crankset directly within the BB30 frame. This adapter includes a CNC-machined aluminum shell, and replaceable Enduro bearingss for the ultimate in creak-free smoothness. Perfect - BB30 fit to new Ultegra Cranks. Delivery was stated at 5-7 days. Actual delivery was 2 days. Installs easily and rides smooth. No complaints. I'll try the ceramic bearings next time. This easily converted my BB30 cannondale system six to allow Hallowtech cranks. Very satisfied. Love my Ultegra cranks on a BB30 frame! As always JensonUSA order processing was lightning fast. I've never received free 2 day shipping from any other retailer but Jenson. You just can't ask for any better customer service. A bit resistant until they were worn-in. Love the bottom bracket. is this adapter the one I need to install a shimano ultegra crankset in a Cannondale Synapse bb30a frame? This presses into a BB30 bottom bracket and then accepts the Shimano Hollowtch cranks. I used this on a Cannondale System 6 frame, and 10 speed Dura ace crank set.